In this blog post I will explain what sketching is and what are its five most popular types. P.S. I took this text from my book “The SKETCH“. Travel sketching (or sometimes city or urban sketching): expressive, energetic and usually extremely fast drawings of architectural details, city views, restaurants, etc. It can be made both in open air (“pleinair” in French) and working from your memory – recollections of your trip when you are back at home, or using photos and creating compositions out of them. 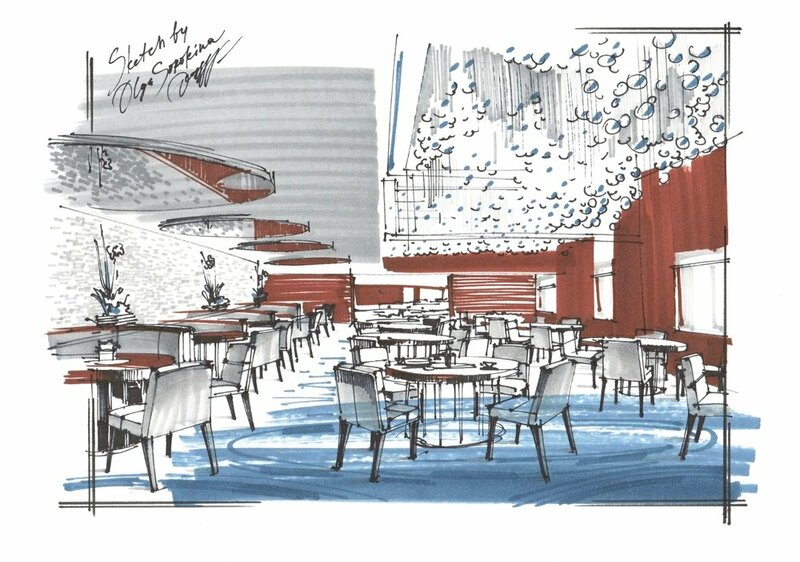 It includes “cafe sketching” as well. Fashion sketching: people, fashion-looks and accessories. It is used mainly for illustrations or magazines, e.g. for brand promotion. It helps designers during the first stages of creation of their collections and helps to introduce changes. 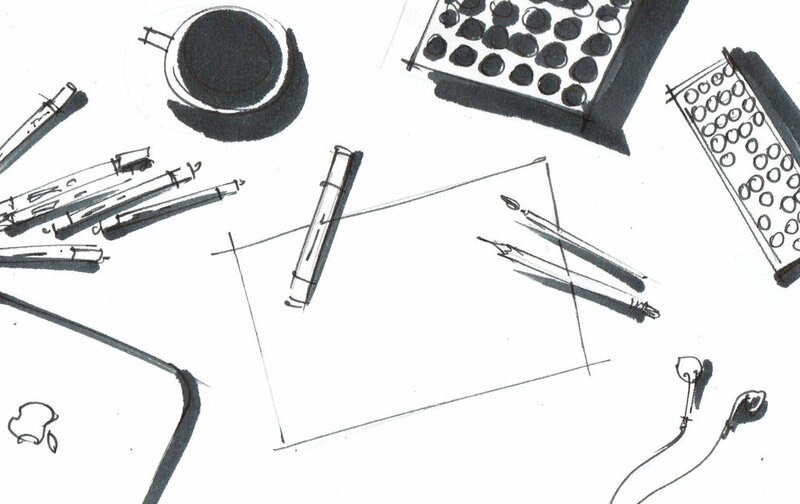 Industrial Design sketching: probably the most known and popular branch of sketching. Obviously, it was created by industrial designers; a good example is car sketching. In this case, all sketches are made with great speed and confidence. The type of sketching I teach my students via online courses, Instagram Lives, and YouTube tutorials is a little different, it’s an interior design sketching, and we usually start by creating a precise measured perspective with help of scale rulers. This is followed by freehand rendering which may take 1-2 hours, and for this stage we will be using markers. 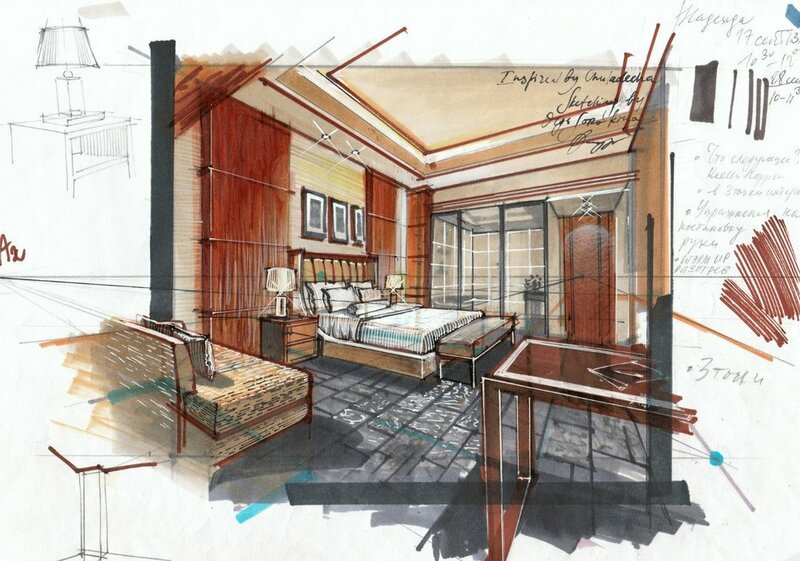 Once you have mastered the construction technique, you will develop the ability to produce quick freehand sketches of interiors. Sketching is an amazing skill which lets you transfer your design idea onto paper in the most fun, fast and effective way. In other words, sketching is a unique instrument for visualizing your concepts. Nowadays, it is associated mostly with such media as specialized professional markers, for example, Copic, Stylefile, Chartpak, Promarkers, ZIG, etc. Actually sketching “palette” is very wide and versatile: you can start from scratch by using a pencil, charcoal or black liner and end up by using different types of colouring techniques, for instance, watercolour, coloured ink and pastel or watercolour pencils. It is possible to mix different media, for example, markers + pastel or watercolour + coloured pencils. There are so many creative opportunities for you to test and explore! It is a good idea to try several and pick a couple of “favourites”. A range of this kind of media in the art-shops can impress and confuse at the same time. But don’t worry, my friends, in this article on my blog I recommend you a nice and compact set of marker colours, which I personally use most of the time. But why I do recommend markers? This is my answer: in my opinion, markers are the most easy-to-learn-how-to-use and easy to implement technique for beginners (especially in comparison to watercolour) and, at the same time, sketches which are done with markers usually look more vibrant. 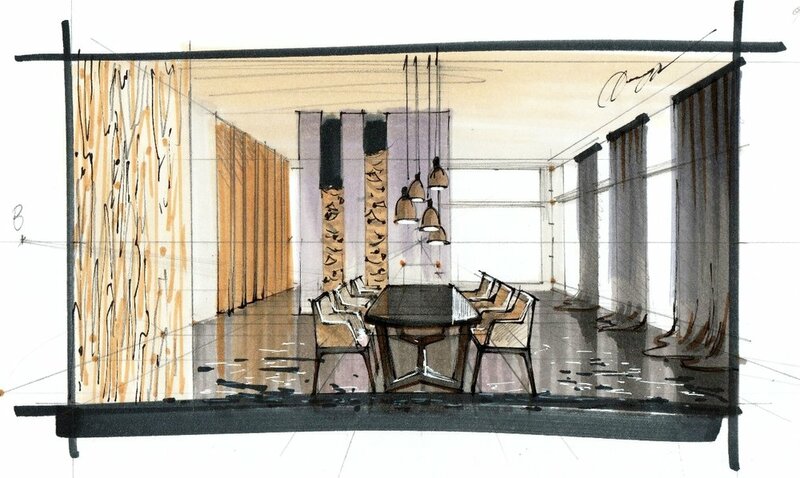 As a matter of fact, in my personal interior design practice, I used to use watercolour and coloured pencils for my drawings, whereas now I opted for markers only because I simply see how much better they perform on paper for interior design purposes. The reason why sketching became so popular today among designers of all kinds not only in Russia, Europe, USA, Asia and the rest of the world is that artists nowadays tend to be overwhelmed by computer programs such as CAD, Revit, Sketchup, 3D Max, and Maya. In the old days, artists were earning their bread by, literally, their hands and now they are desperately wishing to go back in time when ideas were transferred through hand drawing, which is far more natural and organic way of doing it. Just take a look at what is happening right now in our creative lives: we rarely, if ever, write with a pen, and mostly type on a computer, iPad or iPhone. We do not send handwritten letters and cards anymore – epistolary genre is almost gone for good – and even our thoughts and ideas we capture in “Notes” on our iPhones. It seems that we have forgotten the meaning of “handmade”, handcrafted, which is precious because in creating it you include a piece of your heart, love, and memories. Do you remember what we were told as children: “The best present is the one that is made by hands”. There is a profound meaning in that. Just observe that we no longer “create” on paper but “work” on a computer, in Photoshop, Word or AutoCAD. The words we use, especially verbs, bear deep meaning. With that in mind, ask yourself, is it better to render or to hand-render; to work or to create? They say that 3D Max was invented by those who can not draw. Clearly, there is a number of advantages in using 3D and computer-generated imagery, but let us not lose the command of our hands and the link between the brain and the heart that hand drawing fosters. As I mentioned before there are different types of sketching and here I would like to talk about each one in a little bit more depths. Let’s take a quick look at the main features of the most popular of them by splitting them into key concepts and keywords. Interior drawing from my ecourse PRO. Check other sketches here. For this type of sketching it is important to have a good understanding of human proportions (face and body). You should know how to stylize figures in your drawings. More often than not, body proportions are elongated in fashion sketching. For example, the total height of human body in fashion sketching is 10, 11 or even 12 times the height of a human head as opposed to real-life proportions of only 7.5 to 8 heights of a human head. The most important aspect of fashion sketching is to be able to capture a design idea in the best possible light. Hence a facial-portrayal of a human figure is usually not important. In this case, it is critical to be able to deliver the idea of the designed collection to the best advantage. In fashion sketching, it is important to bring the clothing design into focus, and a life-like portrayal of the figure is usually unimportant. You will also need to know how to convey through hand-render the look and feel of such materials and textures as skin, hair, different types of fabric, metal, etc. You will need the ability to draw objects in 3D, clearly showing their structural design and volume. In order to be able to render a professionally looking arrangement of component part on a page you will need firm grasp of the principles of composition. You will also need to perfect your technique and speed in order to develop assured line and confident hand. Most common materials that need rendering in industrial sketching are metal, plastic, and glass. In this type of sketching, the most important skill is to manage to convey the feel, the ambience of a place, to capture the flitting moment and, at the same time, to deliver correct scale and proportions of the object. More often than not, you will also need to be able to perform at high speed, as you will be sketching while travelling, while on the road, when you do not have several hours at your disposal the way it would have been the case with plain-air sketching. In this type of sketching it is important to grasp the intrinsic traits of the place you are observing and afterwards graphically stylize it in your drawing. Check the process of creation of this sketch on my YouTube here. P.S. I hope you enjoyed the content! Let me know what you think in the comments below. Please share this article with your friends on social media. Thanks in advance! Without solid knowledge of the principles of perspective nothing will ever work out. Study the method, refer to my book often and make sure you understand it completely. For the moment concentrate on the frontal perspective – it is a very powerful and hugely useful technique. Remember, that the horizon line level has an effect on the general impression of your sketch. Whether the horizon is at the eye level of a seated person or at 2 meter level above the floor, it is an absolutely critical decision for the whole of the drawing and for how different planes are revealed. A well-chosen view angle and the knowledge of composition are most crucial! They will contribute greatly to your sketch; by making your project look elegant and allowing you to present it to the best effect. To be sure, knowledge and application of the rules of light and shadows, the aerial perspective, tonal gradations and texturing are key. It is these things that give volume and expressiveness to a drawing. Examine as many works and drawings as possible, learn wherever you can: YouTube tutorials or Skillshare classes, drawing exhibitions, read books about design, drawing and illustration. You have to become satiated with visual references for your own new and unique style to emerge. Use quality materials. You don’t need a great number, but make sure they are top quality. For a successful start, you will need 7-10 colours of professional markers (with 3-4 of them being tones of grey), a pencil, a black liner, a white pen, an eraser, and paper. Later on, when you start becoming more involved with sketching, don’t pinch pennies and buy Copic sets. The classic techniques of sketching will always be in high esteem: this are watercolours, Chinese ink, coloured pencils and pastel. But experience tells me that the easiest, quickest and the most effective tool in interior sketching is markers: they give wonderful results, even when you use them for the first time. If you want to become proficient at sketching as quickly as possible, learn from the masters of the craft: take note of their devices, copy their techniques, and use this rich foundation of knowledge to develop your own unique and inimitable style. Remember, that all customers are guided by their emotions when they make decisions, which is why your portfolio and sketches must be “savoury to the eye”. Assess your portfolio one more time and ask yourself: «Would I buy it?» If the answer is «No», burn it and make something spectacular instead! Draw every day and train your eye and hand as much as possible. If you start practicing every day for approximately 30 minutes, it will take you about 3 weeks to achieve a pretty high level of mastery of your hand and your pictures will start showing confidence which is the main quality of a professional, since you can always tell a pro from a beginner by the confidence of their lines and hatchings. Confidence only comes with experience!